They are finally here! Betty’s Nut Sacks, or also called Nut Milk Bags! They are my 2nd favorite kitchen tool/gadget ever, 2nd only to the Vitamix which will always be in 1st place. And these bags are like a BFF to the Vitamix, or any blender really. Click here to purchase your own Nut Milk Bag! I honestly can’t believe how much use I get out of this little nut sack! I use it a few times per week to make fresh almond & hazelnut milks. I also use it when on a juice fast, as I much prefer juicing with my Vitamix and this nut sack more than using my actual fancy juicer. True story! Read more here. I also use this bag for making fast & easy fresh cauliflower “rice”, and for straining my homemade soup stocks, especially my Raw Tom Kha. I am now selling these handy dandy nut milk sacks direct! Just click here to get your own bag! Also included with each bag is a useful little guide with some of my favorite recipes! I have tried and tested many a nut sack, and I honestly truly believe these are the best sacks on the market! They are cut on the bias, so there is a natural give & gentle stretch to the fine nylon mesh when straining. They are industrial strength, machine washable (I have even run them through the dishwasher). For the most part I just rinse with water after use and hang dry, as they dry so quickly, and won’t harbor bacteria like a lot of other sacks on the market. 6. Raw chocolate hazelnut milk smoothies are the bomb! 7. It is truly a “raw” and vibrant milk unlike the processed stuff in the carton. 11. There are no added sweeteners or refined sugars, you get to sweeten how ever you like! 14. And most important, no creatures were hurt or suffering in the making of this milk! Ideally you want to soak your almonds for 8 to 12 hours in water at room temperature to activate the sprouting process. But if you don’t have time to soak you nuts, don’t sweat it, you can still make fabulous nut milk. Blend almonds with 4 cups water on high in a blender. Hold the nut milk bag open with one hand over a bowl, and pour the almond milk into the bag. Twist the top of the bag shut, and gently squeeze out the fresh almond milk. Use the left over nut milk pulp in a variety of different raw recipes. Pour the fresh decadent almond milk into a quart jar and store in the fridge. Sweeten to your liking. I was inspired to make these rawk candy candy cups when I was given a free and fabulous jar of Raw Organic Gold Label Coconut Oil from Tropical Traditions to review in a blog post. Um, yes, I had no trouble signing up for that! And you know what else, I honestly, truly love the Tropical Traditions Gold Label Coconut Oil. Like really love it. It is the softest and richest coconut oil I have used, and I promise I am not just saying that because I got a free jar! Now it’s your turn to get a chance to wine a free quart of virgin coconut oil! Contest Ended May 31st, 2013. Melt coconut oil using a double boiler or food dehydrator. Stir together coconut oil, cacao powder, maple syrup & vanilla into a smooth chocolate sauce. I blended whole macadamia nuts, coconut oil, and honey in my Vitamix to create a super smooth white chocolate. You can also use a store bought cashew or macadamia butter and stir it into the coconut oil and honey if you don’t have a high speed blender. Use an assortment of whatever you have available to you! *You can easily sub in raw cacao butter for the coconut oil, if you want to make a more shelf stable chocolate. Since coconut oil has a low melting point, you will want to store these fancy candy cups in the fridge or freezer. I personally like to store them in the freezer. Take a standard muffin tin, one used for making cupcakes or muffins. Line it with 12 paper cupcake liners. Pour a small about, about 1 tablespoon of dark chocolate into each cup. Then place into freezer to firm up. Once firm, add a spoonful of white chocolate to each candy cup, for the 2nd layer. You can spread it out all the way across, or you can put a dollop in the center to create a secret filling. Also have fun adding in some of your favorite super foods into the white chocolate layer, like frozen berries, cacao nibs, etc. Put back into the freezer to firm up. Once firm, pour over the final layer of dark chocolate and decorate with your favorite superfood goodies! This week I am doing a little juice fast. And this time I am doing it without a juicer. And even though I have a really nice juicer, often the thought of cleaning it out makes me not feel like juicing as much, just being totally honest here! SO, this week I am blending everything up in my Vitamix and straining it through a nut milk bag. (You can order my most favorite nut milk bag directly from me here!) And I have found that I LOVE doing it this way!! 3. You get so much more juice out of each piece of produce. Once you have strained it through a nut milk bag, and given it a good squeeze, there is just a little bit of compacted fiber left to feed to the dogs or toss in the compost bin. As compared to all the left over pulp my juicer creates. 5. You don’t have to spend time cutting up produce as carefully or spend as much time feeding each piece through a juicer. 6. You can really maximize the flavor of the fresh herbs like mint & basil you add, as they get blended in really well. Now, I can totally see where some people would rather stick with a juicer, especially when you are juicing things like wheat grass that get destroyed when being blended to quickly. I completely understand and I totally support you for using your juicer! Juice on!! And I still appreciate having my nice fancy juicer too. It just comes in a far cry in 2nd place behind my Vitamix for how much use it gets. So if you are on the fence as to purchase a good blender or a juicer, I personally recommend going with a nice high speed blender and then purchase an $10 nut milk bag, which can be used for making homemade almond milk and fresh juices! Toss everything in a blender. Ideally fresh is best, but I am in the process of using up the last of last summer’s frozen berries to make room for more this summer! I just blended everything together on high, then poured and strained through a nylon nut milk bag. I gave it a good few squeezes to separate out all the fiber and seeds. I tossed out the fiber and seeds, poured the juice in a glass, and enjoyed every last drop! It was like the smoothest raspberry smoothie I had never had before! For lunch today, I made a delicious green juice version of my Cucumber Gazpacho recipe in my Vitamix (omitting oil, omitting avocado, but adding extra garlic and celery) and it was heavily! I strained it through my nut milk bag with such ease too! WARNING: This Cherry Garcia Ice Cream recipe is so good. Like really really good. It is so refreshing, anti-inflammatory, and it tastes absolutely divine. I was inspired to make this by Girl Cooks World and Vedged Out. This recipe is absolutely RAWKING good, you will likely want to double it! *This ice cream recipe works awesome with fresh coconut meat or with canned coconut milk. I honestly like it both ways equally! optional: 1 Tablespoon vodka, this makes a softer ice cream for scooping, if you plan to keep this frozen for a little while. The vodka doesn’t freeze, so when added to vegan ice creams it makes them softer, especially after being kept in the freezer for a while. Blend coconut meat and coconut water (or canned coconut milk) + 3 cherries (for pink color), sweetener, almond extract, vanilla & lemon juice in a high speed blender. Pour into ice cream maker. While mixing in the ice cream maker, make the chocolate pieces. Gently melt coconut oil over low heat, stir in cacao and maple syrup. Pour onto a piece of wax/parchment paper on a flat plate or baking dish. Freeze sheet of chocolate for 15 minutes, then break into small pieces. *Also check out Vedged Out’s Raw Version using cashews! Eating “raw coookie dough” totally takes me back to being a kid again. And this recipe is so much better for you than that refined junk we ate as kids! 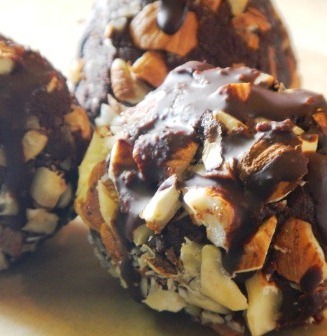 This rawking recipe is egg free, gluten/grain free, and refined sugar free! It is also nut free! Oh, and super easy to make! I got the basis for this simple & satisfying recipe from Good Girl Gone Green! I suggest checking out her blog & recipes, as I have even told her before, we have very similar sweet tooth’s, or should I say sweet teeth?! Blend coconut butter with dried coconut, sea salt & vanilla in a food processor until well blended. Add in dates, blend until well combined, will likely take at least 60 seconds. Drop in cacao nibs, pulse until well integrated. Roll into cookie dough balls with your hands. Will make 9 truffle sized cookie dough balls, or you can make lots of mini cookie dough balls to add to a cup of vanilla chia pudding or vegan coconut ice cream! See below for ice cream & chia pudding recipes. Blend ice cream ingredients together in a blender. Pour into ice cream maker. When ice cream is starting to thicken up, stir in little balls of cookie dough. Once ice cream is ready, serve or put in the freezer for another hour or 2 to firm up even more. Blend almond milk, sweetener & vanilla together. Pour into a bowl, add in 1/4 cup chia seeds. STIR well. Let sit about 15 minutes, stirring on occasion. (If pudding doesn’t feel quite firm enough after 15 minutes, just add in another spoonful of chia seeds). Plop in a few raw cookie dough balls. Enjoy. When my hubby told me he could see this vegan mint chocolate chip ice cream being sold out of Whole Foods by the truckload, I knew I was onto something. My husband is always super supportive of my endevours, and willing to try anything green, but he is also always very honest. So when he is impressed by something I have created in the raw food kitchen, I always know I am onto something. I got an ice cream maker for by latest b-day, and I believe that really helped make this ice cream super soft and creamy like the store bought stuff. Not hard and icy like the homemade ice creams that I made before the Cuisinart ice cream maker came to live with us. I went with the 2 Quart Size. Recipe below easily serves 4 hearty portions, but you still might want to double it! Below is a beautiful photo Christy Richards took of the ice cream she made using this recipe. (see added in chocolate chips instead of the nibs). optional: 1 Tablespoon of vodka, this will make a much creamier ice cream as the alcohol doesn’t freeze! Blend coconut milk, spinach, sweetener and peppermint flavor (and vodka) on high in a high speed blender. Taste test for sweetness and peppermint, adjust to your liking. Pour into your ice cream maker. If you have a Cuisinart ice cream maker, (also available in 2 Quart Size) let it run for 20 minutes, and add in raw cacao nibs slowly for the final 10 minutes. Spoon into bowls, serve, or freeze for later. I am happy to say that the next day, after sitting in the freezer overnight, this ice cream was still super soft and creamy, just like outta the carton, but way better!! *Make sure to adjust peppermint flavor to preference based on the strength of the extract you are using. I personally really like using alcohol free extracts like this one: Organic Peppermint Oil in Sunflower Oil. This bar freaking tastes just like a jelly filled donut, in a grain free, raw vegan sorta way! Blend coconut, vanilla, cinnamon, & sea salt together in food processor for 30 to 60 seconds. Add in walnuts, blend. Then add in 9 pitted medjool dates. Press mixture into a wax/parchment lined pan. Set in fridge to firm up. Blend only raspberries and dates until dates are well combined. Pour into a bowl, and stir in chia seeds. Let set for 15 minutes, stirring on occasion. It will thicken into a nice raspberry “jam”. If not thick enough after 15 minutes, stir in a little more chia until you have the right consistency. Spread over base layer. Pulse topping ingredients together until a nice crumble is formed. Sprinkle over raspberry layer. Garnish with cacao nibs, set in fridge to firm up. You have just created the perfect blissful breakfast bar. Makes 8 medium sized bars! Or 6 large ones. Some days you just need a need a spicy, flavorful, herbie, creamy, soup. This cucumber gazpacho fits the bill. Super easy to make, and fool proof. A great way to pack fresh greens and alkalizing veggies into your day! small handful of or combo of: dill, cilantro, parsley, or other green herbs. Makes enough for 2 large bowls. Blend soup ingredients together in a high speed blender. Chill for a couple hours, or eat right away. Garnish & enjoy! Here are some of Betty’s Favorite MUST SEE Movies! This is my favorite life changing 15 minute FREE video. Please watch!! Please get inspired! This video definitely inspired me to get off the grains! Though I don’t eat organ meats, I do eat a lot of the foods she strongly recommends like kale, seaweed, mushrooms, berries, & lots of veggies. Experience the life changing power of juicing!! Download the movie on Amazon [click here] or Netflix. And here is a link to my personal juice fasting experience. OH. This is A Must See Also. Lots of Raw Food – Health Food Movers & Shakers in this Film! Click here to download. Here are some of Betty’s Favorite MUST READ RAW Books! If you find yourself in the SF Bay Area, I really hope you can find yourself into a Cafe Gratitude Raw Restaurant! They serve up so much amazing food – it’s hard to resist from ordering 1 of everything on the menu! When we were there, we practically did, and it was so much fun to share and taste such amazing raw food creations! I absolutely love this book. At first glance, the recipes can come off as a bit advanced, but there are so many treasures I use all the time, like the Living Almond Hummus, Raw Falafels, and Tom Kha Soup! Yummy! Click here to order. I ♥ Raw Judita!! She is one of my most favorite raw chefs, and I have gotten the most incredible pleasure of helping as a “recipe tester” for her newest book Raw And Simple. I loved her first book Going Raw, that I literally gave out copies of it to friends & family last year for Christmas! I highly recommend both books! Raw & Simple, is full of simple yet elegant and glamorous raw food recipes that will dance you your palate! 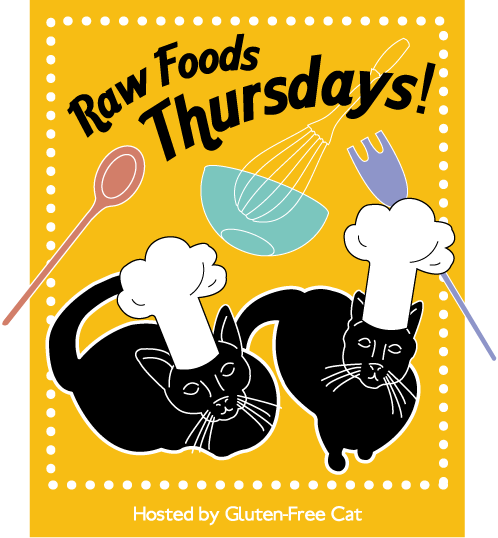 Going Raw is full of a bit more complex, yet delicious raw food recipes that will make you wonder why you ever bothered cooking your food before! Click here to order. Thank you Matthew Kenney for this INCREDIBLE book! This book has inspired many gourmet desserts for my raw dinner parties! Mouthwatering photos paired with creative desserts that entice the palate! Check out his Apple Cobbler, Apple Cider Donut Holes, and Cherry Crisp for sure! The name of this book by Chef Amber Shea says it all “Flexible Raw Recipes Anyone Can Make. This is a great intro to raw foods book, with recipes to integrate raw foods into your diet. She travels around the world in this book incorporating raw recipes from Italy, Spain, Greece, and India. Move over little Miss Strawberry Shortcake, watch out Miss Lemon Meringue, and hold onto your hat lil’ Miss Huckleberry Pie, this treat is full of sweet! “Raw Food Sweets That Make Your Heart Skip a Beat ” by Natalia KW is a true pleasure! The ultimate answer to the raw grain-free cupcake! She has come up with the most incredible base raw cupcake recipe and then takes that recipe into so many different directions! From Lemon Poppy Seed, and Strawberry Ginger, to Black Forest Cupcakes. This little book satisfy any cupcake cravings! You will likely find that your intake of raw vegan hazelnut milk goes up as you fall in love with these light little truffle balls, and you will be looking for any excuse to make more! These truffles would also make great “raw cake pops” as they could easily be stuck onto sticks & served. In food processor, blend hazelnut pulp and cacao powder. Add in dates, pinch sea salt, blend. Add in a little maple syrup to help “stick” together. Roll into balls, and then roll into chopped hazelnuts. Drizzle with raw chocolate. Chill. Serve! Mix ingredients together, melt in food dehydrator, or double boiler. Drizzle over chilled truffles, place in fridge to “set”. Coconut oil chocolate drizzle firms up nicely when chilled. Blend nuts & water in a blender. For best results use a Vitamix. Once nuts & water are blended well into a milky liquid, strain through a Nut Milk Bag. Pour “milk” into a mason jar to drink later, or blend with 1 date or 1 TBS sweetner, and a vanilla bean, and enjoy! Use leftover “pulp” in truffle recipe above. Here are my most favorite secret goodies & tools that I use & enjoy daily in my raw food kitchen! These bags are worth every penny! I am personally selling them for $10 (which includes a little recipe booklet) and they end up saving you some much money and bellyaches from premade prepackaged nut & seeds milks. You can even make your own coconut milk! And fresh squeezed juices without a juicer! And it is the best tool for straining fresh cauliflower rice. I use this lil’ baggie so much! I use it for making hazelnut milk, pumpkin seed milk, even Tom Kha soup broth. Click here to order one from me! Not sure where I would be without my Vitamix?! Well, I’d be without all my favorite drinks; raw hazelnut milk, almond milk, pumpkin seed milk, sesame seed milk, green smoothies, creamy curry sauces…. I use my Vitamix at least 3 times per day. It’s become part of our family and even goes on vacation with us! Click here to buy directly from Vitamix and get Free Shipping. Vitamix has some really great deals right now on certified refurbished machines, starting at $259. Here is a link to the Exact Same Pink KitchenAid Food Processor I have, though, I don’t think they have many left, and the price may have been raised a bit. I am in love with this kitchen sprouter! Counter top gardening was never easier! Just pour a little water on the top tray twice daily, and it will “rain” down to the trays below. No need to soak and rinse your sprouts! Also, this model is great for growing 4 different sprouts at once, and wheatgrass! For those of you use filtered/purified water to sprout, this model is great at water conservation. Tropical Traditions Provides the most incredible Gold Label Extra Virgin Coconut Oil. They run amazing specials every week, sometimes buy one get one free, and free shipping. They also have awesome products like dried coconut, coconut vinegar, and honey. I LOVE my Bubbies! This is my go-to source of probiotics each day! (I no longer take any probiotic pills, and instead eat fermented veggies, kombucha & water kefir) I have started fermenting my own kraut in the Pickl-it jars (shown above), but this is my other favorite source for fermented kraut. Oh, and Bubbies makes the best raw fermented (sugar free) kosher dill pickles EVER too! Found in the refrigerated cooler section of most health food grocery stores, find them here. And if my tummy is ever upset, I head straight for the fridge and a few spoonfuls of Bubbies kraut, and within minutes I am feeling better! I really love & trust this brand! Merry Christmas to ME! This was all I wanted for Christmas last year, and I was so happy to receive it! I have had my eye on these Excalibur Food Dehydrators for about 3 years before finally purchasing one, same with the Vitamix, which was on my wish list for years too! Both are well worth the wait! This model that I have is a little bit extra as it comes with a 26 hour timer, which ya know in all honestly, I hardly ever use. I often just set the dehydrator up before bed, and get everything out in the morning. I also don’t leave things in there when I am away from home, so I can’t say the timer is a feature you would actually need. Click here for Model with a Timer. Click here for Model without a Timer. My kitchen counter is turning into a little indoor green garden area and I LOVE it! Today is Day 4 of my 14 day juice fast. I, like so many people, have been inspired by the movie, Fat Sick and Nearly Dead, to give my body a “reboot” and do a 14 day fresh squeezed “juice feast”. If you haven’t yet seen this awesome life changing documentary, you totally need to download it on Netflix or Amazon. I have been battling this yucky disease, Ankylosing Spondylitis with Colitis, which really just boils down to lots of inflammation in my body. The AS causes fusing of the spine, and like many with this disease, you end up going years before you are properly diagnosed, so I already had fusions of my sacroiliac joints (pelvis) and in a few vertebrae before I had a name to call this disease. And I have been dealing with an inflamed and very unhappy gut & colon for years also, known as Colitis. These two diseases generally go hand in hand. There is a lot of great research out there that supports eating a starch free diet full of fruits & veggies (and for some this also includes meats, eggs, and dairy), but no baked goods, rice, or potatoes in order to fight AS. There is a mean little booger of a bacteria known as klebsiella that love to dine on undigested starches in the gut/colon and then in turn they create more inflammation and fusing for those with AS. I jumped fully into a Raw food diet at the same time I went starch free last October, and instantly noticed a huge improvement of my symptoms. Over the past 5 months I have been eating about 80% raw foods, and the other 20% consisted of cooked veggies, some seafood and a little big of grass fed beef, wine, and just a little bit of coffee. Well, while I was seeing improvement and having some really good days, the inflammation kept creeping back in and creating more bad days, and I found myself reaching for NSAIDS and pain pills again, which in turn destroy my poor stomach even more. I am doing this juice fast in an attempt to get my body out of inflamed “auto-immune” mode, and back into a healthy happy pain free living mode. It all boils down to having healthy gut bacteria, an alkaline body vs. an acidic body, and the right fresh & nutrient dense foods to continue to support the body. I am fully committed to make this happen! I am only 4 days into this fresh juice feast, but so far I can feel my joint/back pain and sore guts finally really easing up. I feel more relaxed than I have in a long time, it’s almost like Juicing is Nature’s own “pain medicine”. I just feel a new calmness, completely stress free, very open minded, and a true sense of love for myself. Oh, and I now have this incredible sense of smell, that must be on the same level as a wild animal, I can smell EVERYTHING – good and bad. I would honestly say that being on a juice fast creates a more heightened sense of awareness for the universe. Pictured below is the Omega Juicer I bought on Amazon, but you can find used juicers all over the place too, check your local craigslist! Also, read more here on how to do make fresh juices without a juicer!! Pictured above you will see my Breakfast, Lunch, & Dinner that I drank on 3 of my Fast. I love waking up to fresh squeezed apple + lemon + ginger juice, and I don’t see that changing anytime soon, especially not over the next 10 days! Here is a link to pages of wonderful juice recipes published by those who made the movie Fat, Sick, and Nearly Dead. Everything you need to know about juicing can be found on their Reboot Website. Apples, lemon, ginger, wheatgrass & parsley. My most favorite juice so far! I am happy to report amazing progress so far on my 9 days of juice! Only 5 days to go. Other than some vivid dreams last night of fresh salmon fillets served with crisp slices of cucumber lightly seasoned with a vinaigrette, fresh dill and slices of bright green avocado, I haven’t had a hard time not eating anything yet. Not eating has actually been the easy part. Day 1: Sleepy. Very sleepy. Day 2: Sleepy. Some light headaches. Day 3: Noiceabley less inflammation in joints & tummy. Feeling relaxed. Normal work day. Day 4: Feeling super relaxed, a bit dazed, no real pains, my nose is working overtime, I can smell EVERYTHING. Pretty normal work day. Day 5: Massage & Chiropractic appointment after work. Overall, pretty good day. Small bouts of pain in joints, almost felt like healing pains. Day 6: Got in some exercise at the gym after work. Feeling pretty good. Still a bit tired. Day 7: This was going to be my home “Spa Day” but turned into a really crappy “Sick Day”. Icky, lots of snot, sore throat, headaches. Some back pain. Day 8: I basically made 2 noises for half the day, “Aaaoooo” and “Uugghhh”. Still really sick, some fevers. Just let my body go through the process of detoxing. I was able to crawl out of bed and make it to the Mac Saturday Farmers Market for some more amazing produce, made some great juice, and then crawled back into bed. Day 9: HELLO World! My tummy hasn’t been happier in years and it’s flattened right out. I can barely feel any inflammation in my body. I am definitely on the right track, it would be easy to stop cuz I feel pretty great, but I am determined to experience a full body healing, so I will push on! Last night I also incorporated the help of this little product called Oxy Powder. I had read good things about it cleaning out your insides, and people report great results while fasting. While I don’t usually endorse pills or supplements, I will say that I believe this gut cleaning powder is helping my body work through the detox. Since I felt amazingly better the day after taking it, I will continue to use this in the week to come. I should also add that 3 weeks ago I tried colonics for the first time, and I did 2 back to back appointments as recommended, but I personally did not feel any better after the experience. Again, I had read good thing about colonics, but they weren’t true in my case. I will say though that the juice fast & oxy powder is working without a doubt and I am feeling tons better! Be sure to check out this amazing post by Farmer K on The Good, The Bad, and The Ugly symptoms that come along with a successful body cleaning detox, which is definitely worth every sacrifice! Farmer K is helping her husband fight AS, and she has done an excellent job of summing of what to expect in the beginning of a juice fast! I just completed two amazing weeks of 100% juice and water fasting. They say your appetite will return with vengeance when it’s time to come off a juice fast, and I can say that was definitely true for me. Initially I thought I might go for 30 days, but after two weeks of drinking only fruit & veggie juice my body started screaming at me to start eating again. Around Day 11 I started intensely craving fish, and I was thinking about it day and night. While there are definite ups and downs on a juice fast, it wasn’t nearly as hard “not to eat” as I thought it might be, and my body was ready to do some detoxing and it happily went to work. I rode the detox roller coaster through some painful healing moments, but was able to take it easy and rest assured my body new what it was doing. You can feel old aches and pains come to life briefly during the fast as they heal up properly, it’s pretty fascinating. On Day 6 I had some stabbing hip/pelvis pain which I hadn’t felt in years return for an afternoon, in the same place I now have fused SI joints, but something told me the pain was a good thing, as my body worked overtime to clean things up and heal old wounds. I also experienced a short lived piercing earache one night, as a child I used to get ear infections constantly (which I now blame for my damaged gut, as the doctors constantly had me on antibiotics, which destroyed the well balanced eco-system in my tummy). I had not had an ear infection in over 20 years, but was quickly reminded of how painful they can be, and then as quick as the pain came on, it vanished again less than an hour later. To sum it all up though, I was completely painless upon completing the fast. This is what made the juice fast one of the most amazing experiences of my life. I can’t remember the last time I was not in any pain. I am now used to living day to day dealing with painful joints, a cramped up bloated tummy, and a back that often screams at me. And here I am after drinking juice for 14 days, 100% pain free, as it wiped out all of the inflammation in my body. I am still continuing to juice daily, and eat a cleansing diet, but I have also incorporated fruit smoothies, fresh veggies, some nuts & seeds, and a little fish back into my diet. I am a firm believer that a diet rich in alkaline foods helps to heal the body and prevent pain & disease. This juice fast was living proof of that. During my fast I also did a fair bit of reading on the strategies around food combining, which is something I had not yet explored. Over the years, I have come across a lot of people with Anklyosing Spondylitis, Colitis, Candida, and other ailments who have given up fruit. To me it just never seemed right not to banish fruit to the dark side. Fruit!?! Seriously!?! Like the most simple and satisfying food I have ever tasted, which happens to come in its own biodegradable packing, ready to eat and hydrate me. I even saw a doctor last year, who told me very sternly to avoid all fructose and he was completely anti-fruit other than a few small handfuls of berries on occasion (since they are so low in sugar anyway). I replied that we had a small apple orchard at home along with a blueberry patch and grapes. His response was to sell the apples to someone else and not eat them! Needless to say, I tried his crazy diet for a month, but quickly knew it was not for me, as it just went against all ingrained common sense. So, what I have recently learned about food combining I believe could help quite a few people handle fruit better. The 1st golden rule to food combining is: Eat fruit alone. Eat your fruits in the morning by the handful, in smoothies, or juices, just don’t combine them with any fats or proteins, and don’t eat any fats and proteins for a few hours after eating fruit. Fruit digests very easily and quickly in the body, but fats and proteins can linger for hours in the tummy until they are properly digested, and when combined with fruits, the fats and proteins cause the fruits to then get hung up for hours in the tummy and in turn the fruits start to ferment. This is when the painful bloating kicks in. There are certain veggies & greens that go great with fruits, like celery, cucumber, and lettuce, so you are encouraged to incorporate these veggies & greens into your smoothies & juices. There are a few other simple rules to food combining, including don’t combine fats & proteins. Here is a link to an easy to read food combining chart. I am excited to give food combining a try. So far so good. Over the past few days I have made a point to eat fruit with fruit and my body is really happy about it. I know there will always be exceptions to the rule, and certain raw treats, which are fruit & nut based, where I will bend the rules, but on a day to day basis I plan to give my body the healing foods it needs to stay happy, healthy and pain free! This juice fasting experience has restored so much energy back in my body! Fasting is detoxifying both physically and emotionally. I am thrilled that I naturally removed all the inflammation in my body without the aide of anti-inflammatory drugs or pain pills!! If people knew how amazing you can feel by giving your body the right foods and nutrients it needs, there sure as hell wouldn’t be a fast food junk food industry, and we’d turn the medical industry upside down. I look forward to continuing to do juice fasts, with a goal of juicing to welcome in each new season. Here is a picture of the local elk herd recently enjoying the “Green Diet” in our front yard.